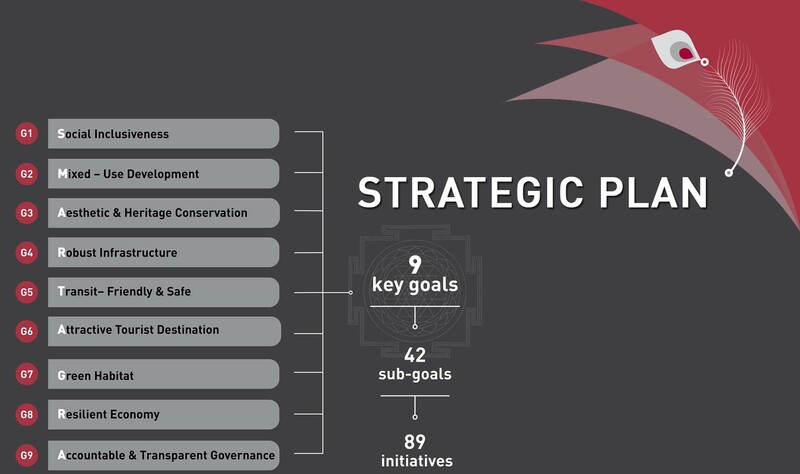 The strategic plan for Agra Smart City identifies 9 key goals, that have been further divided into 42 sub-goals and 89 initiatives. and zardosi work by 2019. SG – 1.2: Rehabilitation and in-situ development of slums and unauthorized colonies. SG – 1.3: Provision of basic infrastructure to enhance livability in slums. SG – 1.4: Availability of and accessibility to social infrastructure such schools, PHCs. SG – 1.5: Provision of affordable primary, secondary and tertiary healthcare services. SG – 2.1: Developing 175 hectares of tourism hub along Fatehabad Road by 2021.
greenfield areas of the city by 2025.
a compact, high density mixed-use development. SG – 3.1: Revival and beautification of the existing 48 ASI sites in the city by 2021. 100% underground sewage network by 2019.
disposal of waste using waste to energy plant by 2019. SG – 4.3: Conversion of 100% streetlights to LED by 2019. SG – 4.4: 24x7 water supply with SCADA system and 100% smart metering by 2021. SG – 4.5: 24x7 power supply with smart grid and smart metering by 2021. SG – 4.7: To meet 10% of city's water demand through rainwater harvesting by 2025.
bus services, cycle sharing scheme and creation of walkways by 2021. 2021 and 25% by 2035.
footpath to promote NMT by 2025. SG – 5.6: Laying 30 km of metro corridor to provide connectivity across the city. evening markets, stalls, that showcase the culture of the city. etc. on a frequent basis. SG – 7.1: Creating at least five 100% municipal-waste wards across the city by 2021. SG – 7.2: Achieving 50% recycling and reuse of wastewater by 2021.
such as leather shoe industry, petha industry, handicraft industry, etc. biometrics, medical equipment, BPOs/KPOs, IT-industry, BFSI, etc. SG – 8.3: Leveraging on existing hospitals and medical facilities to create a Medi-city. and grievance redress of all basic services by 2018.
hazards through SMS by 2019. SG – 9.3: Robust optic fibre network with WiFi spots across the city by 2025.
development charges, impact fees, etc. © 2018 | Agra Smart City Ltd.
Conceptualised By: Gaia Pvt. Ltd.